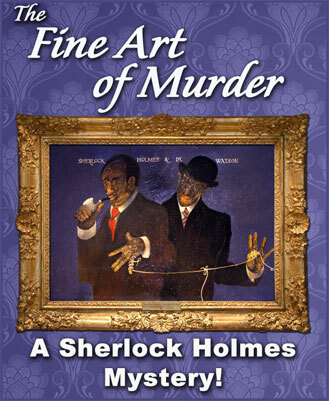 "In the castle of a wealthy Countess, Sherlock Holmes is re-united with his trusted side-kick Dr. John Watson for a thrilling case of murder and deception, when a body is found at the foot of a priceless painting. Can Holmes solve the riddle and crack the case? More importantly, can he solve it in time?" What made me even more excited about Mysteriously Yours was when I found out that Rossy Earle (@PanCanCooks) is the executive chef there! I love her food and absolutely love, love, LOVE her SupiCucu hot sauces. The Fine Art of Murder cast posing for pictures after the show. Julia and I had a great time at Mysteriously Yours ... Mystery Dinner Theatre. I thought The Fine Art of Murder was well-written, funny and packed with numerous hints and clues, making any one of the characters a possible suspect to the murder. Props to the cast as well...they were awesome! I really liked how they would walk around the theatre, not only during the show but also during breaks, talking to guests and posing for pictures... the entire time in character. Really fun! Last but not least, it's cool how the play incorporated guests that were there to celebrate a special occasion (i.e. birthdays, graduations, anniversaries, etc.) putting them on the spot a.k.a under suspicion for murder too! Fun times indeed at Mysteriously Yours. Bravo!